Anybody in a role of leadership will find themselves having to do some public speaking at some point in their time as leader. Public speaking is often feared and yet it is a skill which can be easily improved with planning and practice. Remember, most great leaders were also great orators – some were able to inspire others to act just through the power of their oratory and little else! – so learning to master public speaking is one way of ensuring that you are practising effective leadership. Most people hate the sound of their own voices but it is actually one of the most powerful and valuable tools a leader can use. People who manage to control and change their voices – in terms of speed, pitch, force, volume and emotiveness – are at a great advantage when communicating to others. Tone – this refers to the characteristics of a sound; for example, a voice that carries the tone of laughter can induce the audience to smile. Beware of speaking in a monotone, especially if you are reading something out loud – this is very boring! Volume – this refers to how loud the sound of your voice is – most good speakers know how to project their voices and capture their audience’s attention, without actually shouting. Pitch – this refers to how high or low your voice is – this is genetically pre-determined to some extent but you can try and control it to convey a certain image. For example, a high pitch often indicates nervousness and uncertainty whilst a deep voice tends to convey confidence and authority. Pace – this refers to how fast you speak. Many people talk fast when they are nervous, which makes them difficult to understand and also uncomfortable to listen to. However, talking too slow can also be boring – so try varying the pace keep the audience interest. Color – this refers to the “emotion” that is injected into your voice; for example, you can say the same sentence “I have some news” with surprise or delight or dread in your voice and this will convey different impressions to the audience. While you have to work with what you were born with, to some extent, it is still possible to improve your voice. One of the best ways to do this is actually to listen to it – record yourself and listen to it or speak out loud while at home, driving, walking, etc – even at work, monitor your voice when you are talking others and assess if you’re using it how you want. Practise moderating your voice and see if you get different results. Public speaking is not only about your voice and what you say but also about your body language – how you stand, how you move – and what that portrays. Remember, people are not only listening to you but also watching you so make sure that your posture matches what your words! In general, a good, confident posture (standing tall, shoulders back, head up) will help you speak more clearly and effectively. 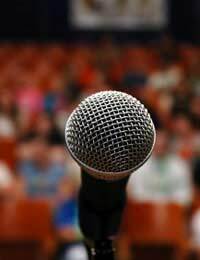 The biggest challenge for most people when it comes to public speaking is fighting the nerves which can cause your voice to go squeaky, your body to twitch nervously and your mind to go blank! Tension causes the throat to tense up and so pitch voices higher; it causes shoulders to tighten up and limit your flexibility, while also causing your legs to shake and make you unsteady on your feet! The best way to deal with nerves is not to fight them but to work with them. All the best performers welcome the extra “kick” they get from the adrenalin and use it to their advantage to lift their performance. So instead of falling into ‘flight’ mode – engage your nerves and see the speech as a challenge – this puts you in ‘fight’ mode instead and helps you use the nerves to gain an extra edge. Finally, practice, practice, practice will help you cope with nerves better. While you will still get nervous, having had the chance to run through the scenario several times and knowing your speech so well means that you will feel more confident and in control. Don’t just practice by yourself – try to get a “live” audience of family, colleagues or friends to practice in front of and get feedback; alternatively, video yourself and review it critically with a colleague or friend.